Shipwreck stories like the famous ‘Titanic’ accentuated by a moving love affair between a young man and woman are so pulse-stirring that they have gone into film scripts and relived on the big screen. It is in this vein that we hear of the oldest shipwreck in the Indian Ocean discovered recently five miles from the ancient site of Godavaya at a depth of 30m; so much so is the interest the discovery has evoked that it has brought together a team of researchers both Sri Lankan, American, German, French and Turkish in that desire to assess the archeological potential it carries. This voyage formally announced at a press confab last Friday largely attended by this entourage of researchers comes in the wake of invaluable archeological discoveries such as Black and Red Ware (BRW) and two purified glass ingots, the tests of which done from December 2010-11 by an international team of divers and archeologists led to an agreement being signed between Sri Lanka’s Department of Archeology and the Institute of Nautical Archeology, Texas A&M University, USA to undertake collaborative research activities to excavate the Godavaya shipwreck discovered by two local fishermen in 2003 named RP Sunil and BG Preminda who spoke to The Nation. The research team was drawn from the local Department of Archeology, Institute of Nautical Archeology, USA, University Texas A&M and University of California at Berkley and France (French National Centre for Scientific Research). The shipwreck, close to the Walawe Ganga, could provide significant details of the cargo it was carrying. Incidentally, the Walawe Ganga was one of five navigable rivers on the island listed by the Classical Author Pallaudis, according to the Director-General of Archeology, Dr Senarath Dissanayake who was on Friday joined by Prof. Osmund Bopearachchi now serving with the French National Center for Scientific Research in Paris, Prof. Deborah Carlson, INA President and faculty member of Texas A&M University and Sanjyot Mehendate of the University of California, Berkley. 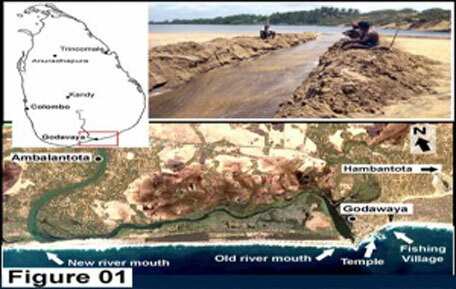 Research has unearthed wind-blown furnaces at Samanalawewa in upper Walawe river valley which is absolute proof of the existence of iron smelting technology as early as the beginning of the Common Era, but researchers say it is too early to hypothesize on the relationship between the furnaces and the Godavaya cargo on which the brains are now working. The first object uncovered, and the first piece of evidence on the chronology is the grinding stone analogues to one carrying an inscription found buried under the Yatala stupa terrace located in Tissamaharama, the ancient capital of Ruhuna. But the grinding stone found in the Godavaya shipwreck, though deprived of an inscription written in early Brahmi, has two Hindu symbols carved on the surface of the stone; the nandipada (footprint of the bull Nandi, Siva’s vehicle), and the srivasta (Sanskrit for ‘endless knot’), the mark of Visnu’s chest where his consort Sri Laksmi resides. Another stone ‘bench’ similar in profile also found buried under the present terrace of the Yatala stupa carries a similar Srivasta symbol. Interestingly, as attested by the carvings on a stambha (column) at the northern ayaka (frontpiece) of the Jetavanarama Dagoba built by King Mahasen (274-301 CE), these symbols: Srivasta and Nandipada appear in Buddhist context. Also, there are two carvings of a fish symbol on the Godvaya stone object which can be seen on Sangam age coins of the third and second centuries BCE. The same symbol can be observed on coins depicting a temple on the obverse and the fish symbol on the reverse. The earliest coins in Sri Lanka bear designs derived from the second series of Pandyan multi-type coins stuck during the period of circa 210-175 BCE. Notably, a similar type of coin was found in the structural period dating to the second century BCE from Sri Lankan and British excavations in the ancient citadel of Anuradhapura. This object goes to provide strong evidence for the close cultural links between Sri Lanka and India. In that context, as Prof. Bopearachchi points out, the Gadavaya shipwreck is immensely important in tracing its link to that period of trading between the two countries.